Simple step by step instructions on how to make an easy bechamel sauce which is great for so many dishes! If there’s one thing about cooking that makes me nervous, it’s making different sauces. 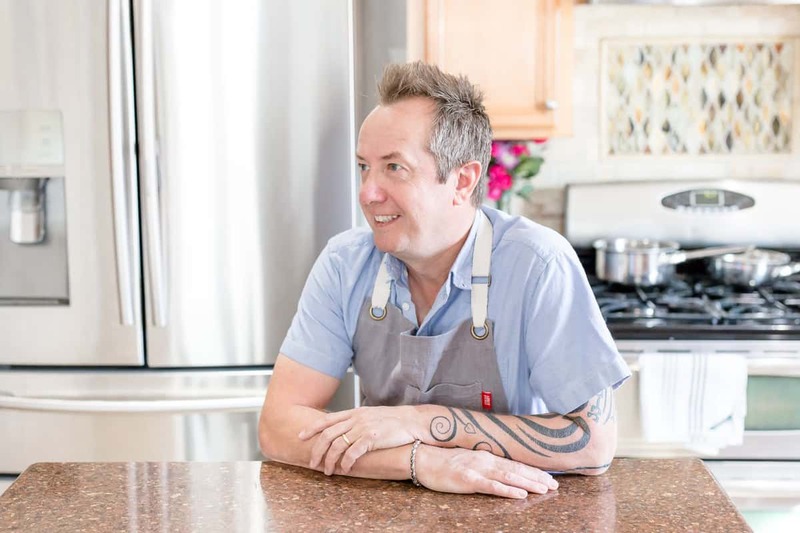 With such a fine line between being successful or ending up with a curdled and useless mess, it’s really important and can make or break any recipe! 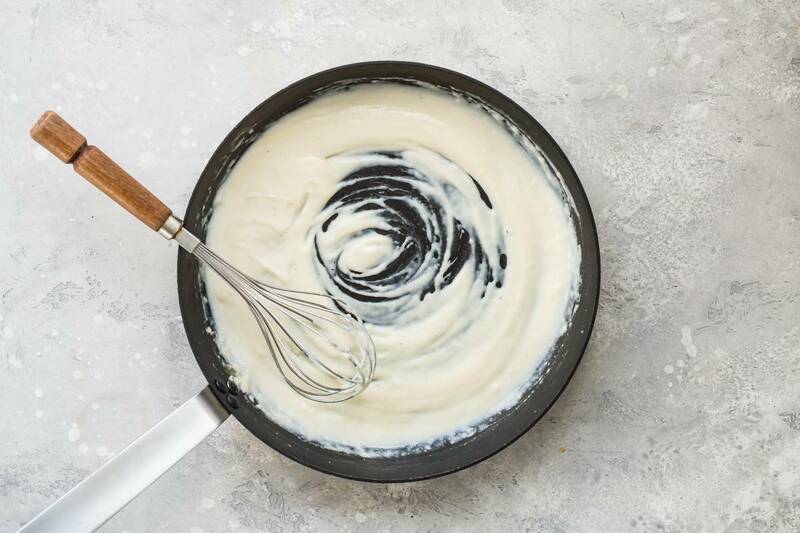 Bechamel sauce is one of my favorites to make though because it’s really easy and a sauce that every home cook should have in their kitchen experience. It can also be used in so many different recipes like my Turkey Pot Pie Mac and Cheese or this Creamed Kale. 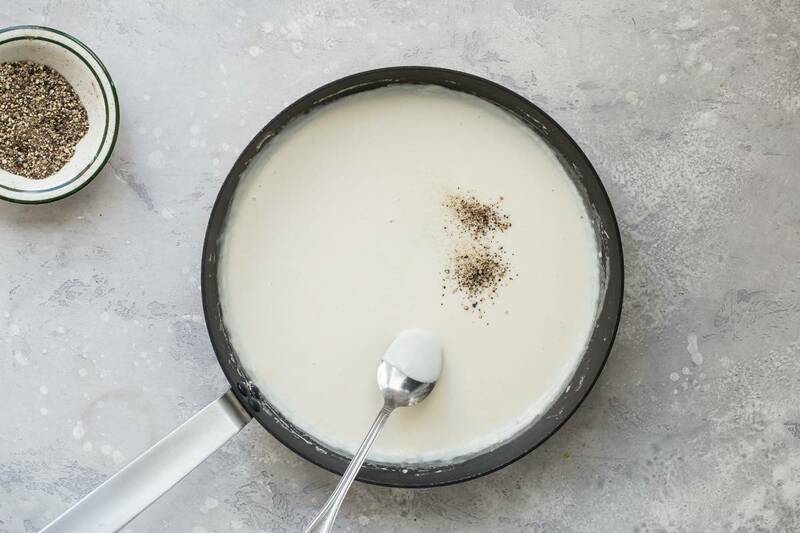 Bechamel is a French sauce and consists of only a few ingredients, butter, flour, milk and seasoning such as pepper or nutmeg. 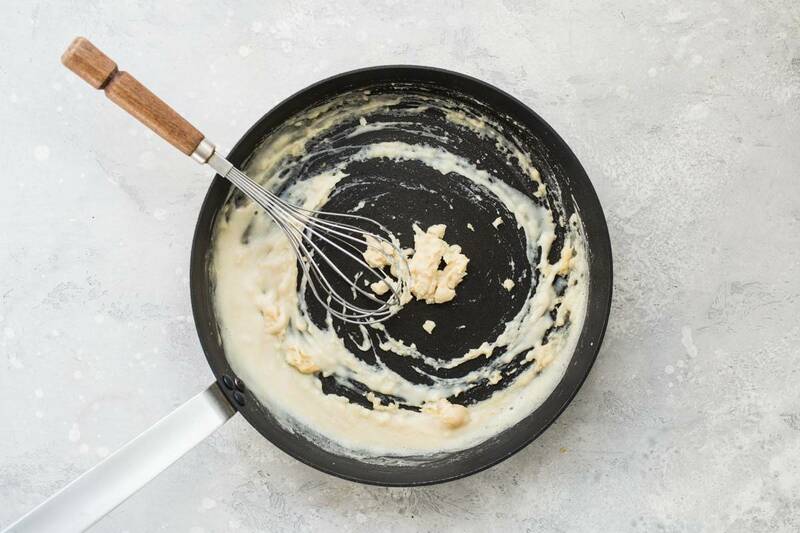 A traditional bechamel begins with a roux which is another French term for combining butter and flour together. This is the base for our bechamel and what will ultimately thicken it. Making a bechamel sauce is a process which is easier to watch being done rather than to read the recipe in a book in my opinion. That’s why the images below will help guide you through the different stages of making your easy bechamel sauce! I usually always use the amount of butter as a guide for how much sauce I’ll need. Two tablespoons will yield about 1 1/2-2 cups of finished sauce but this will change if you’re turning the sauce into something else like a cheese sauce for mac and cheese. Once you add your copious amounts of grated cheddar, because we want a really cheesy sauce, you’ll need to compensate with more milk so the final yield for a sauce like that might end up being closer to 4 cups. Melt the butter over medium heat until it’s fully melted and slightly frothy. Have the rest of the ingredients on hand because the butter will burn easily and we don’t want that for our bechamel so turn the heat to low for now until we add our flour in the next step. 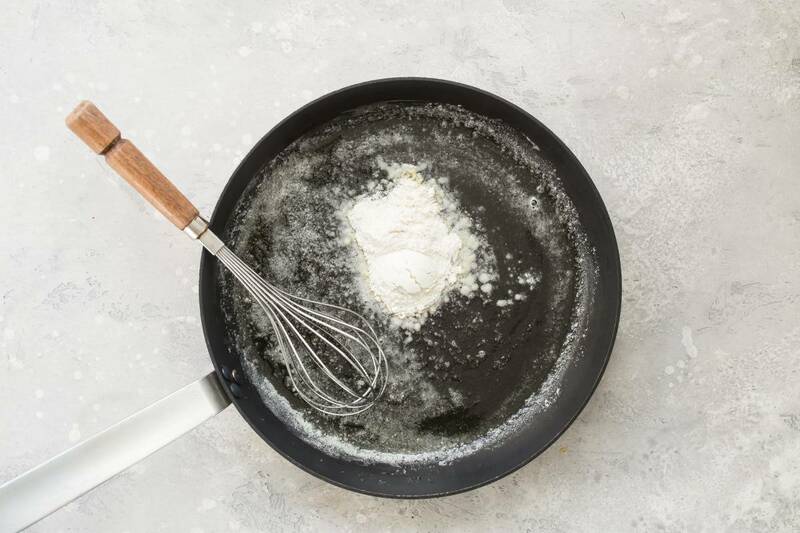 A roux consists of equal amounts of butter and flour, so if we used two tablespoons of butter then we’ll add two tablespoons of flour to the melted butter. All purpose flour is fine to use and you’ll need a whisk to complete the bechamel from here on. 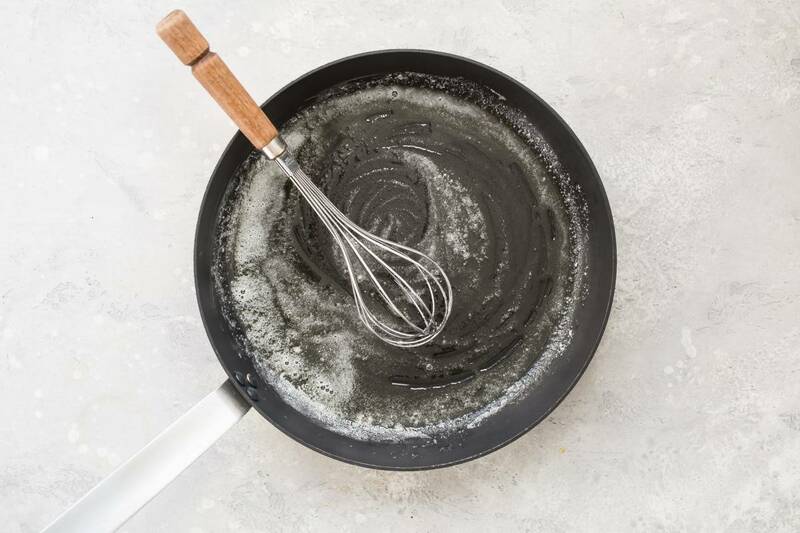 The roux will eventually smooth itself out after a few minutes and the longer we cook it at this stage can determine the flavor and color of the finished bechamel. This is also how to begin making gumbo but at this stage, the roux would be cooked longer to become a deep golden color. We just need it t be pale yellow in color so keep an eye on the heat and turn it down to low if you need to. There are two very important parts to this step and those are, making sure the milk is warm and adding it very gradually, to begin with. The reasons are mainly to make sure there are no lumps when the bechamel is finished. When you add the first half cup of milk the mixture will seize up, become lumpy and you’ll probably wonder if it’s ruined. But don’t worry because this is just part of the process. If you can imagine adding all of the milk at one time, then the lumps will have nothing to push against to smooth themselves out. They’ll just float around the pan and you might end up making most of them disappear but not all no matter how much you whisk. 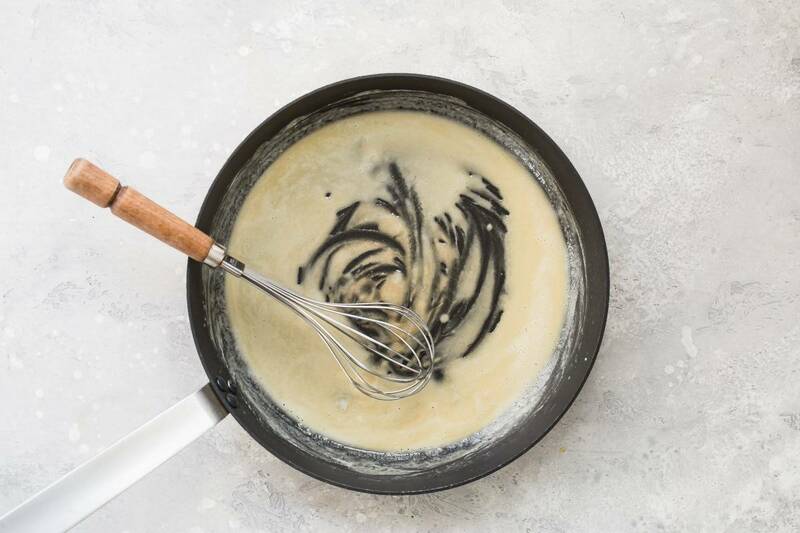 If you add a little milk each time, then the roux has much less room to move around so the molecules push against each other knocking out the lumps and eventually working itself into a smooth paste. 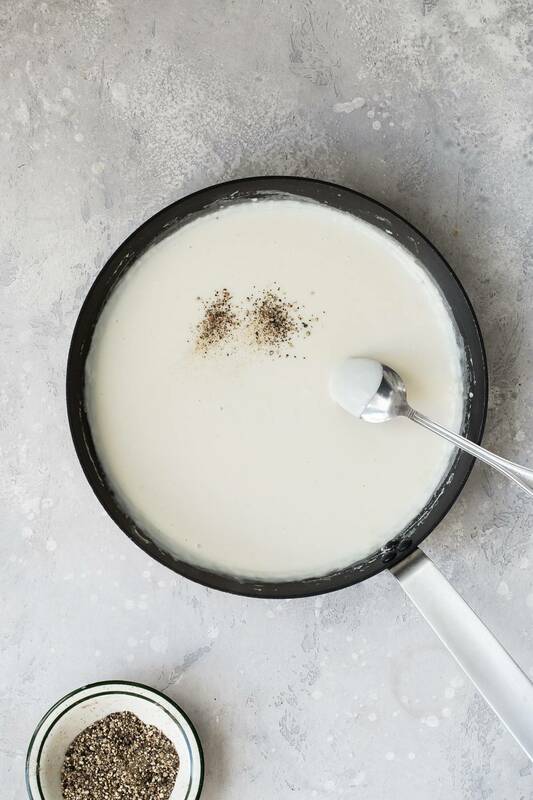 As the bechamel absorbs more milk and becomes smoother you can add more each time because the chances of still having a risk of lumps in the sauce are nearly zero. Once you’ve added all of the milk, finish the bechamel with some salt and pepper. It’s now ready for being added to the layers of meat and sauce for lasagna or you can add cheese for a creamy rich cheese sauce. Any cheese will work even blue cheese which is fantastic poured over crispy french fries! Don’t forget if you add cheese, you’ll need to add more milk. Cheese is also a thickener so it makes sense that if you add it, then you’ll need to compensate with more liquid. I like my cheese sauce to be on the thin side but it’s a personal call from here on so dip a spoon in the bechamel and see how it pours from it. Another thing to be aware of is, as bechamel becomes cool it’ll also become thicker. To bring it back to its original creamy state, just place it on a low heat and add a splash of milk while whisking and it’ll be back to normal in five minutes. This easy bechamels sauce is a workhorse for so many recipes. It makes the best cheese sauce for my mac and cheese and is ready in minutes! 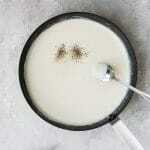 Warm the milk over low heat in a small pot. In a large nonstick pan, melt the butter over medium heat. Add the flour and whisk until smooth and pale golden in color. Add about 1/4 cup of the warm milk to the roux and whisk until the milk has been completely absorbed by the flour and butter mixture. Keep adding milk in 1/4 - 1/2 cup amounts making sure to whisk after each addition. Once all of the milk has been added, simmer for 5 minutes while whisking. Finish by seasoning with salt and pepper.